HiyaHiya Steel Interchangeable Needles are made from high quality stainless steel and feature swivel connections with flexible cables and lifeline holes. The joins are almost invisible and the finish is slick without being too slippery. Four Cables: 16", 24", 23" & 40"
You have the choose between 4 inch and 5 Inch needle tip length when attached to the cable. Combines the small and large sets. 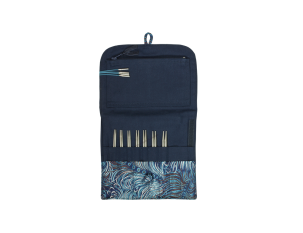 Includes 13 sets of needle tips, 4 Cables, Small Cable Connectors, Tip Adapter, Small and Large Stoppers, Small and Large Single Point Adapters, Puppy Snip, Darn Its, and Knitters Safety Pins.